I took a really simple approach to this weeks Twilt, “Garden in the Window”. A fused 9″ square of Asian Print was cut into nine 3″ squares and fused in place with even spaces between the squares. I used verigated quilting thread to machine buttonhole stitch the squares in place. I added another decorative stitch around the edge. After binding I sewed little flowers in the corners. 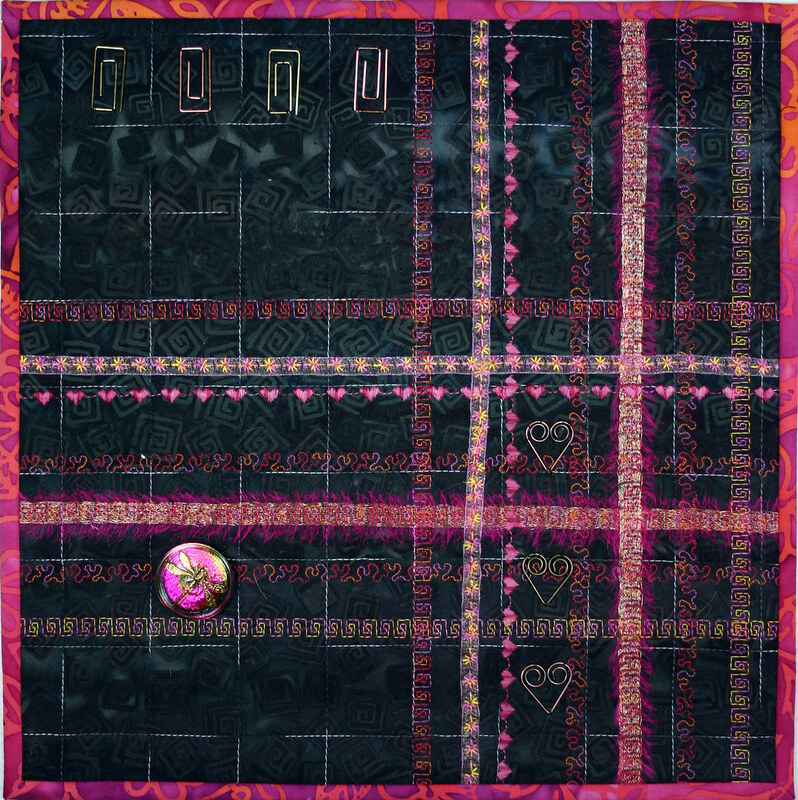 Quilting threads and built in decorative stitches were the focus of my experimentation that ended up as this Tuesday’s Twilt, “In the Pink”. I chose an interesting batik that was mostly black but had some cool striations going on. I also liked the square spirals in the print. 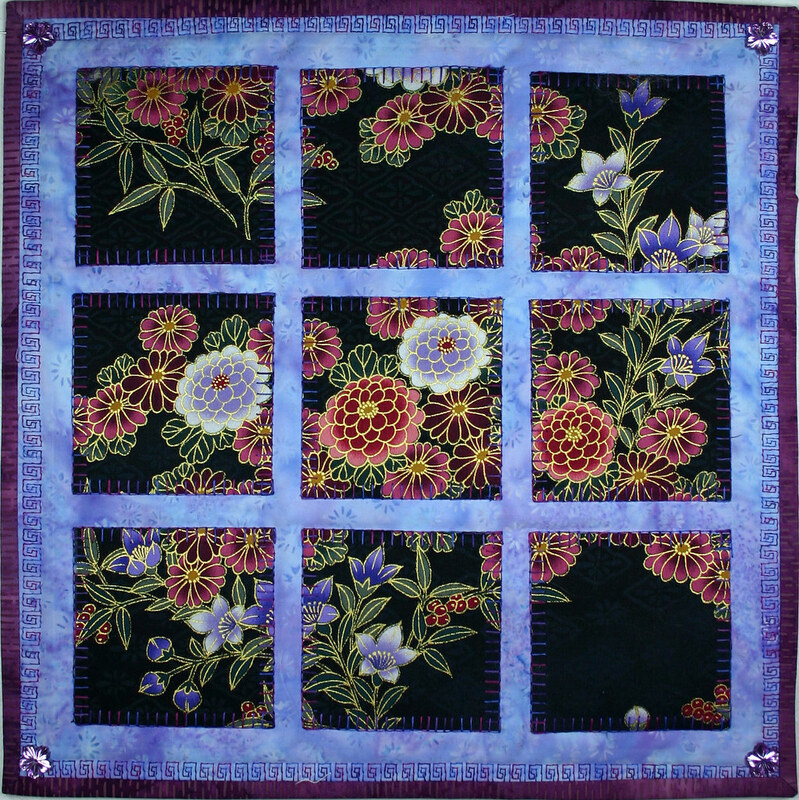 The piece was first grid quilted with a black and gray verigated thread in 1 1/2″ intervals. 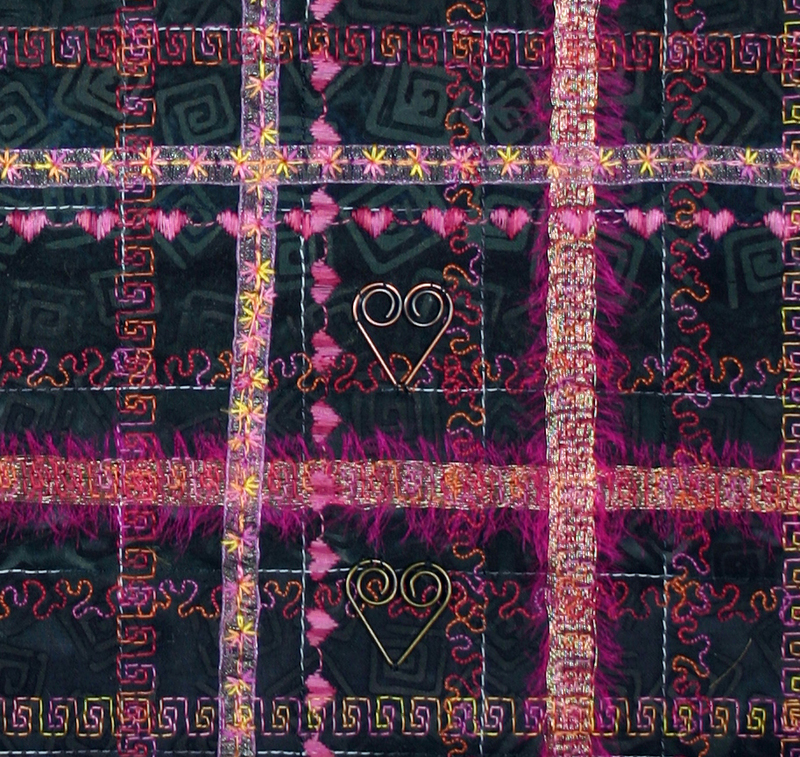 I played with some scrap fabrics at first and then started stitching rows of square spirals, hearts and stipple using several colors of verigated quilting thread, King Tut from Superior Thread. A couple of rows have torn silk-metallic organdy fabric underneath the stitching and I frayed the sides outside the stitches. I also used organdy ribbon under a couple of rows. I chose stitches I thought would compliment the batik. I just tried to have fun. A Dragonfly button and square spiral and heart paper clips embellish and compliment the stitches and background design. I could see this technique used for Table Runners and Christmas gifts. It has a lot of possibilities. 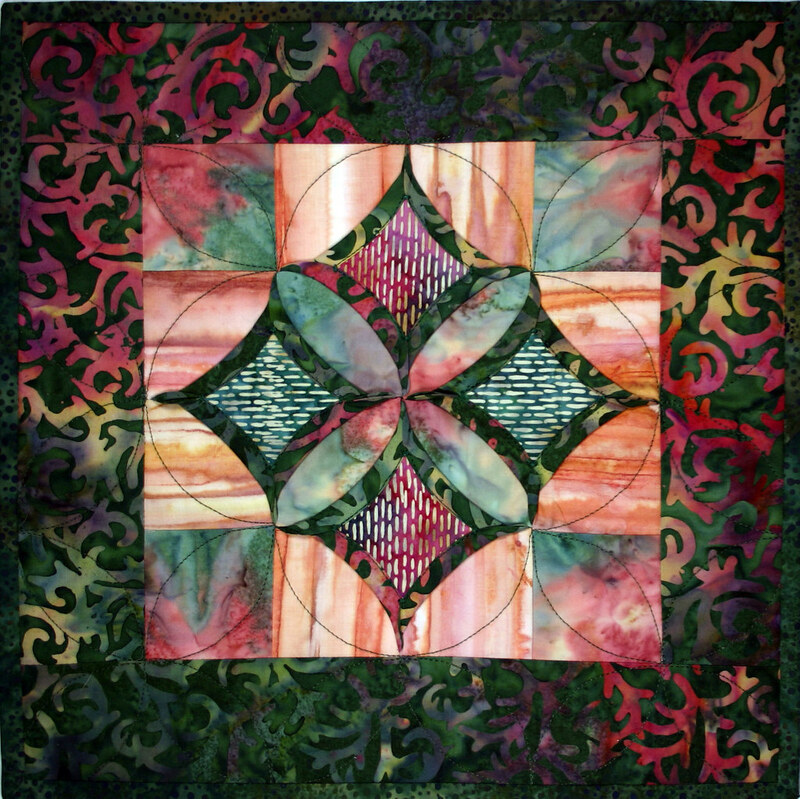 I’m busy prepping for a quilt show in Lake Havasu Arizona but I found the time to look through the unfinished box again this week and found this block that was left over from my second book, “Machine Stitched Cathedral Stars”. Floating Windows is the first block in the book and the fall colors just called out to me in this “Ode to Fall”. It’s wonderful that pieces that could sit in the cupboard forever get to shine as Twilts. 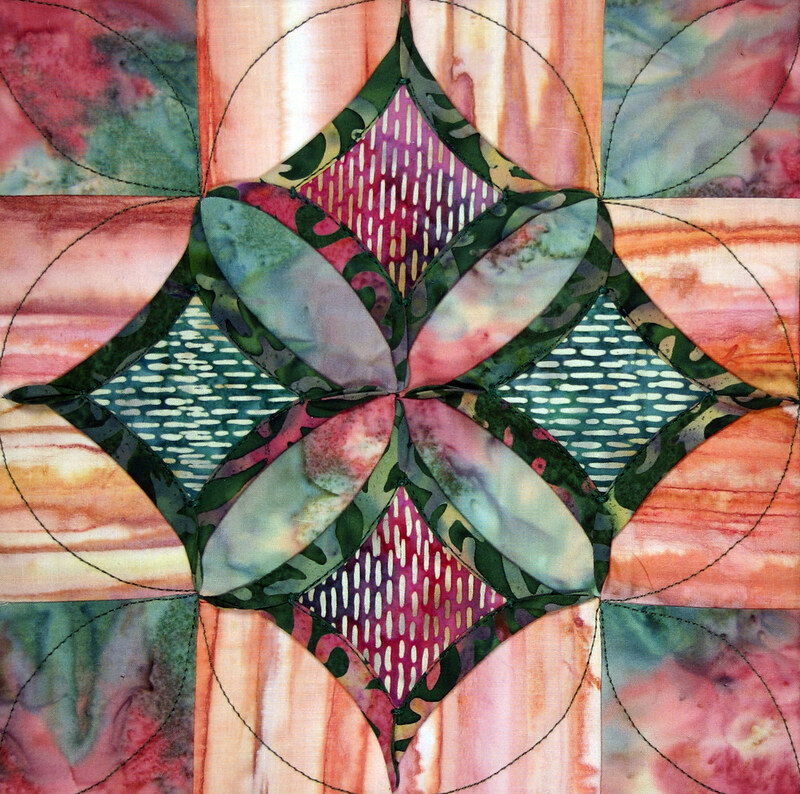 I particularly liked the batiks I used in this block. I did need to quilt it out and to do that I used a freezer paper circle and moved it along as I stitched along the edge of it which means marking isn’t necessary. For info on the book check out the page on my website or on Amazon.